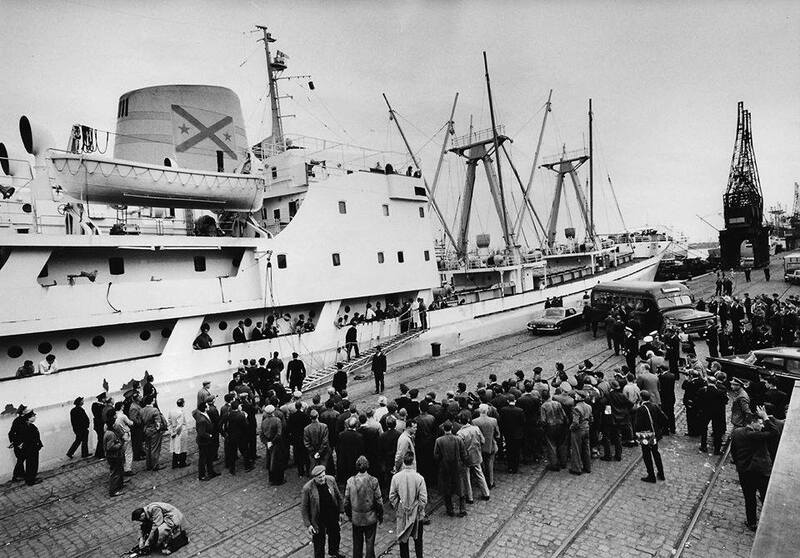 After five days at sea on the Swiss freighter Celerina, 27 survivors of the crash of the ill-fated Flying Tiger 923 were able to stand on solid ground at the docks of Antwerp. For those who got off the ship early, homecoming to Antwerp was a total mystery. Thanks to Teresa Foley of Roseville, California, we can view the docking as it happened. She is the daughter of survivor Air Force M/Sgt Peter Foley, who at that time was a reporter for the Stars and Stripes news in Darmstadt, Germany. Teresa came across her now deceased father’s keepsake box and has provided us photos of the Belgium reception. The photos were taken by the U.S. Air Force. Scores of international newsmen crowded the dock in Antwerp as the rescue ship Celerina arrived. Many interviewed passengers and sent information to their media sponsors. Who do you know above? 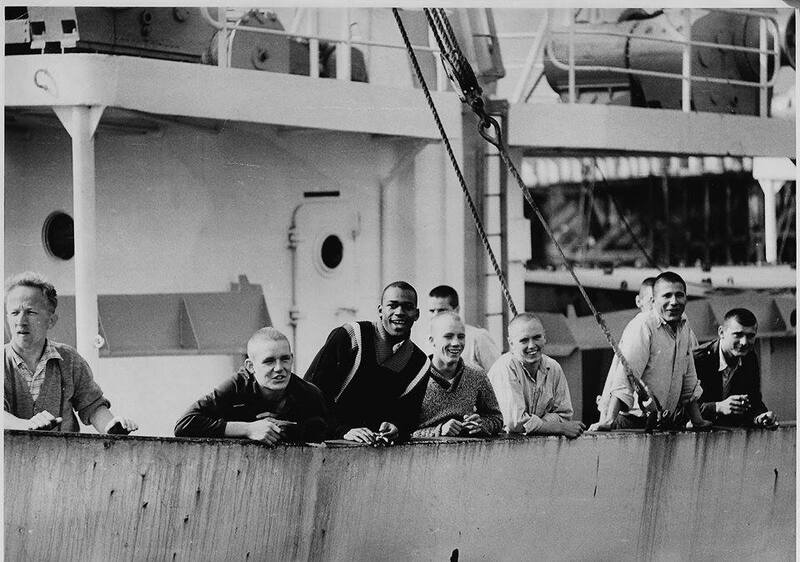 Almost on land, young paratroopers crowded the railing of the ship to see all that they could see. Can you identify anyone? Let us know. Private Paul Stewart , Ardmore, Oklahoma gets assistance on debarking at Antwerp. All were provided with food and drink and quarters for the first night in port. Unfortunately several were unable to leave the ship without assistance. Right, Pvt. 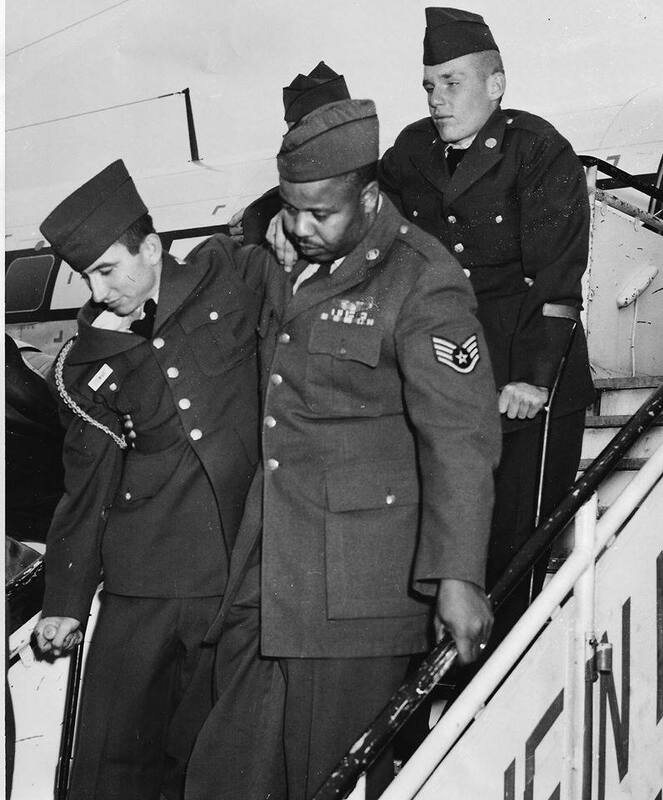 Paul Stewart of Ardmore, Oklahoma is being helped by an air force Sergeant who was part of the reception committee. Helga Groves, being unable to walk and having been severely traumatized, was carried off the Celerina by stretcher. Helga’s husband, Sgt. John Groves, was lost at sea. Surviving stewardess Carol Ann Gould wrote recently that she was with Helga when they were pulled up from the raft to the boat. She said that the ship captain gave the two the use of his cabin. Carol Ann said she had all she could do to keep her from jumping overboard to be with her missing husband. Carol Ann wrote “I would love to get in touch with her.” Can anyone help? Use the comment section of this site and we will pass the information on. We are also trying to reach Paul Stewart from Ardmore, Oklahoma (shown in the photo above). If anyone knows Paul or a member of his family, please let us know. You can use the comment section to reply. This entry was posted in Uncategorized and tagged Antwerp Belgium, Celerina. Bookmark the permalink. The black paratrooper in the middle is my uncle Robert “Bobby” Dawkins. He currently lives in Atlanta, GA.
To the left of Bobby Dawkins is my brother, Michael Murray, who was also a paratrooper. Mike has since passed away from exposure to agent orange while he was a green beret in Vietnam.